April 1, 2018 for only P750.00 nett/person. Can you believe it? Summer is here once again! Expectedly, common notion prevailing the air at this time of the year is that, I should go on a diet. I should have that beach body worthy of my IG. But the tender reality is that, well, it doesn’t always follow especially when there’s a food feast spread right in front of me. Yeah, that’s the real story of my life and I bet yours too! 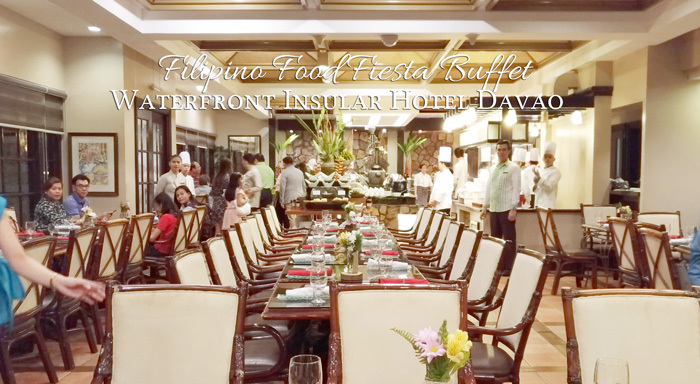 In time for the 81st Araw ng Davao, Cafe Uno of Waterfront Insular Hotel invited yours truly to the exclusive preview of their Filipino Food Fiesta. 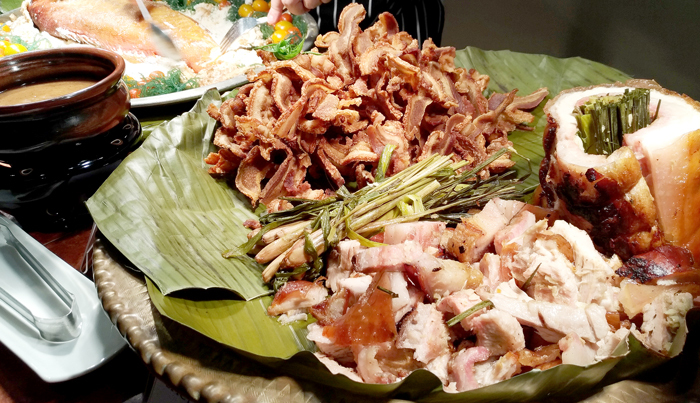 It’s an eat-all-you-can spread that’ll showcase and highlight the Mindanaoan food culture. I haven’t been to Cafe Uno for a little while now, so I was in awe to see all the blend of colours and flavours set before me on the counter. But first, we were first treated to a cocktail reception while waiting for the cafe doors to open. We were served Sampak, it's a refreshing drink portmanteau of salabat and pakwan. There was also a special Maranao Dance for the guests to take pleasure in. 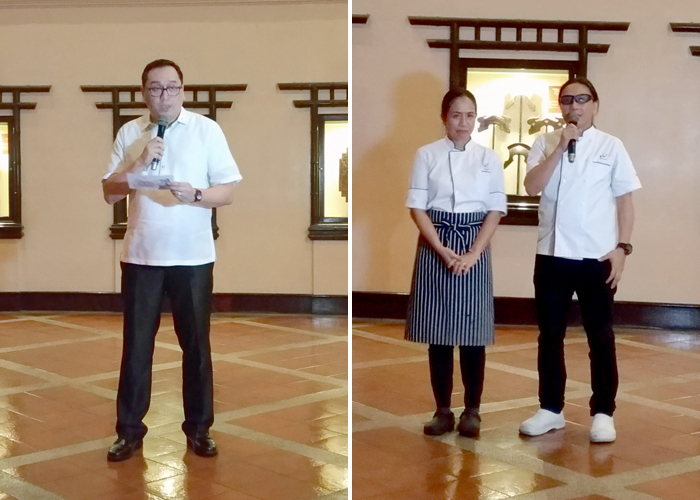 Also present during the launch were Celebrity Chefs Jackie and Roland Laudico, who were instrumental in carrying out these new offerings at Cafe Uno. 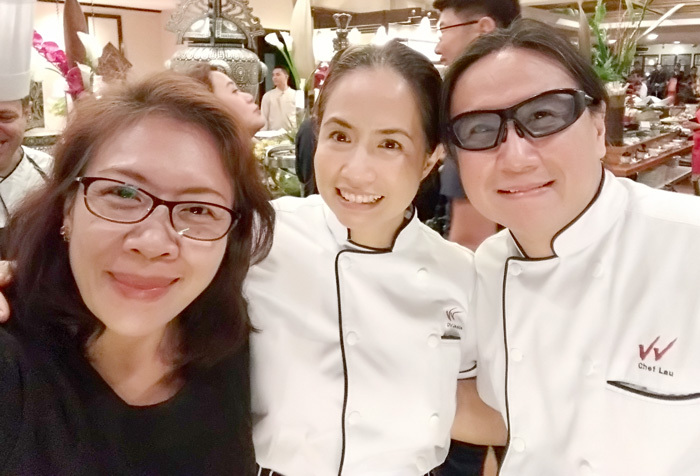 They both worked to demonstrate their signature styles of cooking to bring out the best of Mindanao cuisine. 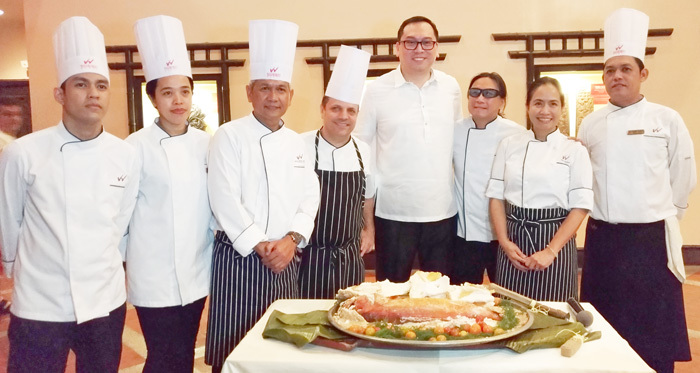 To mark the launch, Chef Lau cracked the salt crust of the huge baked maya-maya. I sampled it eventually and it's one of the fish dishes you should look out for when they officially open doors on April 1. 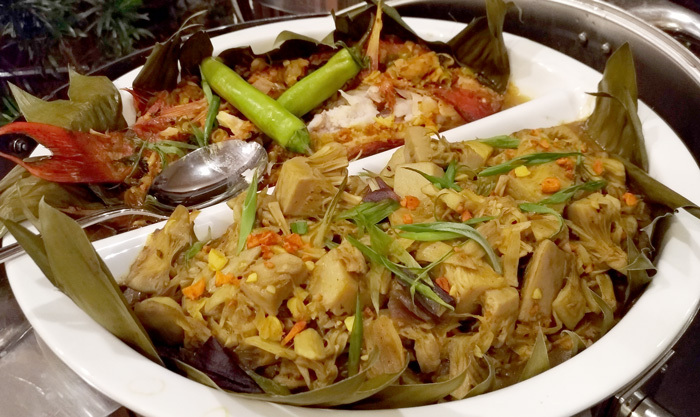 Chef Lau polished traditional Maranao and Tausug dishes with his flare of signature cooking in this spread. 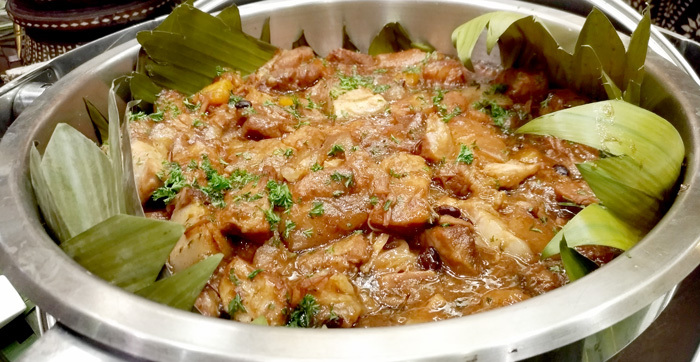 Piyanggang Chicken, a time-honoured Tausug cuisine prepared using burnt coconut paste giving it its distinctive black colour made a debut at Cafe Uno’s buffet counter. 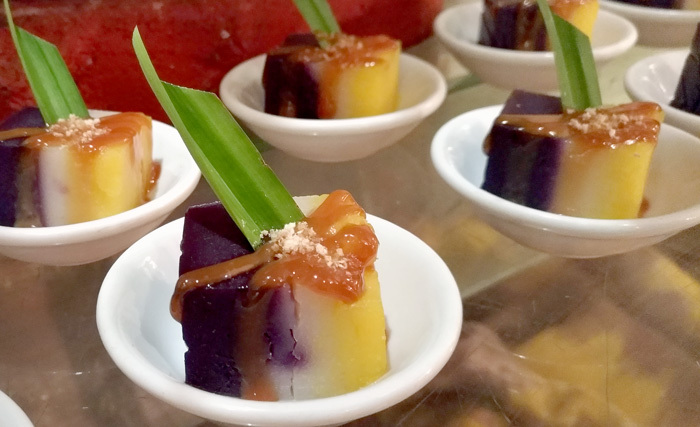 Tiyula Itum, a black beef soup with burned coconut, Sayur Nangka, a young jackfruit curry dish, Fish Piyalam, a baby lapu-lapu in turmeric and lemongrass sauce will be among the exotic dishes on choice at the buffet. A Maranaoan specialty, Piaparan Shrimps, a creamy curried shrimps cooked in coconut and spices will also be one of the highlights. 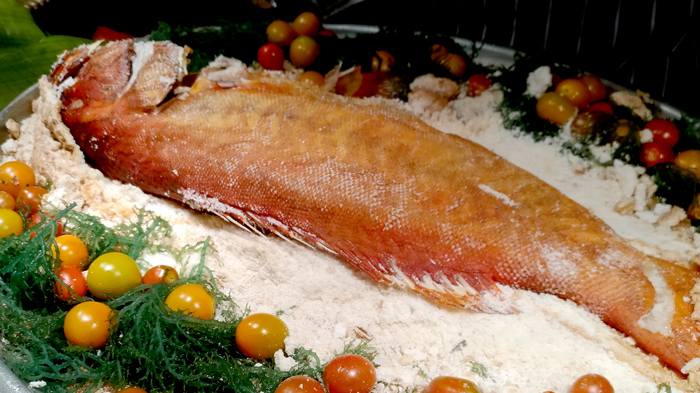 “Everything is done from scratch, using the best quality and seasonal ingredients we can find,” said Chef Lau. Salt Crust Baked Maya-Maya. Served flavour-packed, juicy and smoking hot. Definitely one of the dishes you shouldn't miss for the world. Grilled Fresh Seafoods. 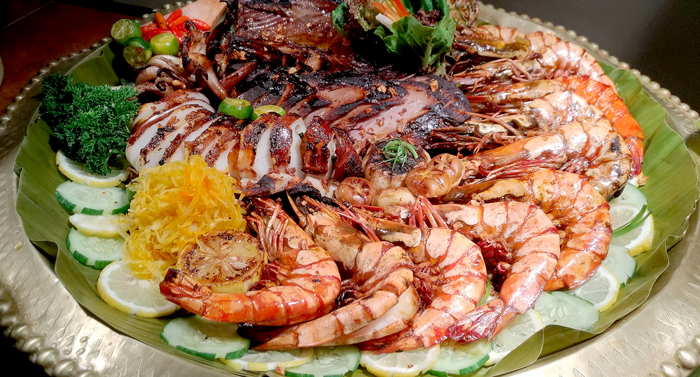 What's not to love about this mouth-watering platter? They're as juicy and as delicious as they look. Let's celebrate life and food here this summer! Spicy bellychon and crunchy bacon. There's a a secret to living an awesome life - crunchy bacon! This Pork Humba is life! When you think life disappoints you? Think again. All you need is a night with good company and a heaping serve of this irresistible humba. Trust me, it works all the time! 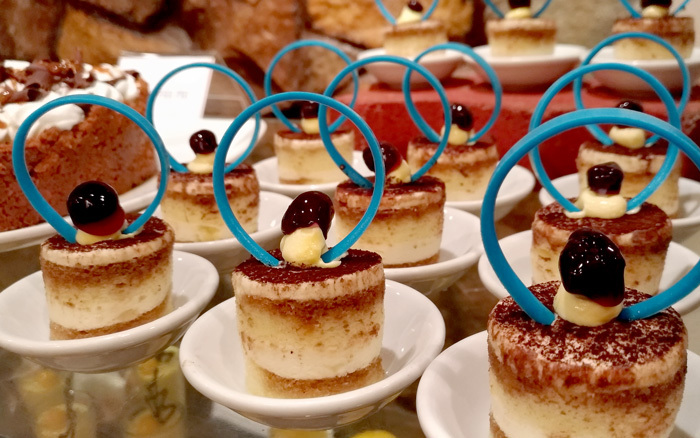 And what’s a buffet without a heaven of desserts? 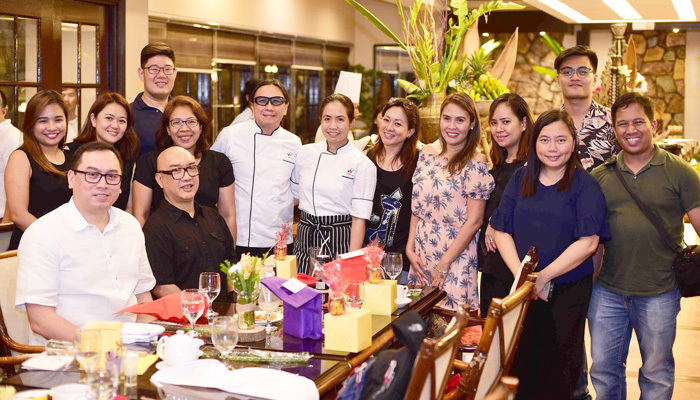 Chef Jackie Laudico left a sweet culinary legacy at Cafe Uno by putting up a counter filled with a variety of desserts made from Davao’s signature fruit, durian. There’s Durian Fruit Pavlova, Durian Tiramisu, Durian Caramel Cake and Durian Panacotta. The art, the flavour, the colour it's a sweet spread you can't resist. The sugar-dusted Pineapple tart was a bomb. It was so good, you'll dream of it! It was a wonderful night meeting new friends, even made great with live band singing songs of my life on the background. Chef Jackie's Durian Tiramisu. I really like this, you see, colours can change everything. They're like sci-fi dessert to me. Deliciously cool! Thank you, Waterfront Insular Hotel for having us! The night ended with me forgetting that illusive beach bod. Who cares? Got good company + good food = Good life. Make Cafe Uno one of your summer destinations this year!